Donald Shoup is Distinguished Professor of Urban Planning at UCLA, where he has served as Chair of the Department of Urban Planning and Director of the Institute of Transportation Studies. His book, The High Cost of Free Parking, explains how better parking policies can improve cities, the economy, and the environment. In the book Shoup recommends that cities should charge fair market prices for on-street parking, use the meter revenue to finance added public services in the metered neighborhoods, and remove off-street parking requirements. 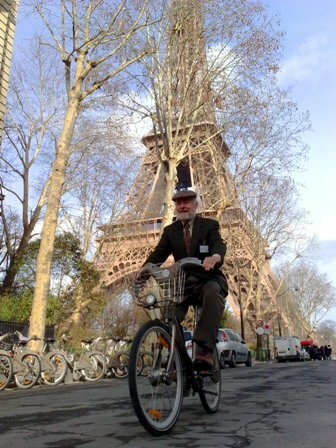 Donald Shoup is a Fellow of the American Institute of Certified Planners, an Honorary Professor at the Beijing Transportation Research Center, and the Editor of ACCESS magazine. Donald Shoup, "Making Parking Meters Popular," Access, No. 45, Fall 2014, pp. 35-37. Donald Shoup, “Informal Parking Markets: Turning Problems into Solutions,” in The Informal American City, edited by Vinit Mukhija and Anastasia Loukaitou-Sideris, Cambridge, MA: MIT Press, 2014, pp. 277–294. Donald Shoup, “The High Cost of Minimum Parking Requirements,” in Parking: Issues and Policies, edited by Corinne Mulley and Stephen Ison, Bingley, UK: Emerald Group Publishing, 2014, pp. 87–113. Donald Shoup, "Parking Charity," Access, No. 44, Spring 2014, pp. 35-37. Donald Shoup, “Informal Parking on Sidewalks: The Broken Windows Effect,” in California Policy Options 2014, pp. 145-162. Gregory Pierce and Donald Shoup, "SFpark: Pricing Parking by Demand," Access, No. 43, Fall 2013, pp. 20-28. Gregory Pierce and Donald Shoup, "Getting the Prices Right: An Evaluation of Pricing Parking by Demand in San Francisco," Journal of the American Planning Association, Vol. 79, No. 1, Winter 2013, pp. 67-81. Donald Shoup, "On-Street Parking Management or Off-Street Parking Requirements," Access, No. 42, Spring 2013, pp. 38-40. Michael Manville, Alex Beata, and Donald Shoup, “Turning Housing into Driving: Parking Requirements and Density in Los Angeles and New York,” Housing Policy Debate, Vol. 23, No. 2, 2013, pp. 350–375. Donald Shoup, “Prefacio,” in Políticas Públicas Destinadas a Reducir el Uso del Automóvil: Manual para Implementar Sistemas de Parquímetros en Ciudades Mexicanas, 2013, pp. 6–9. Donald Shoup, "Solar Parking Requirements," Access, No. 40, Spring 2012, pp. 38-40. Donald Shoup, "Ending the Abuse of Disabled Parking Placards," Access, No. 39, Fall 2011, pp. 38-40. Donald Shoup, Free Parking or Free Markets, Access, No. 38, Spring 2011, pp. 28-35. Donald Shoup, Graduated Parking Fines, Access, No. 37, Fall 2010, p. 41. Donald Shoup, "Putting Cities Back on Their Feet," Journal of Urban Planning and Development, Vol. 136, No.3, September 2010, pp. 225–233. Donald Shoup, "Fixing Broken Sidewalks," Access, No. 36, Spring 2010, pp. 30-36. Donald Shoup, "Graduated Density Zoning to Encourage Land Assembly for Infill Development," Zoning Practice, January 2009, pp. 2–7. Donald Shoup, "The Politics and Economics of Parking on Campus," in Stephen Ison and Tom Rye (eds. ), Transport Demand Management Measures: An International Perspective, 2008, pp. 121--149. Donald Shoup, "Graduated Density Zoning," Journal of Planning Education and Research, Vol. 28, No. 2, Winter 2008, pp. 161–179. Donald Shoup, “The Price of Parking on Great Streets,” in Abhijeet Chavan, Christian Peralta, and Christopher Steins, Planetizen Contemporary Debates in Urban Planning, Washington, DC: Island Press, 2007, pp. 52–56. David King, Michael Manville, and Donald Shoup, "For Whom the Road Tolls," Access, No. 31, Fall 2007, pp. 2-7..
David King, Michael Manville, and Donald Shoup, The Political Calculus of Congestion Pricing, Transport Policy, Vol. 14, No. 2, March 2007, pp. 111-123. Donald Shoup, "Cruising for Parking," Access, No. 30, Spring 2007, pp.16-22. Donald Shoup, Chinese translation of "Cruising for Parking." Donald Shoup, "Cruising for Parking," Transport Policy, Vol. 13, No. 6, November 2006, pp. 479-486. Donald Shoup, "Review of Transport of Delight," in Journal of Regional Science, Vol. 46, No. 3, August 2006, pp. 568–570. Michael Manville and Donald Shoup, "People, Parking, and Cities," Journal of Urban Planning and Development, Vol. 131, No. 4, December 2005, pp. 233-245. Donald Shoup, "Parking Cash Out," Los Angeles Times, April 17, 2005. Michael Manville and Donald Shoup, "People, Parking, and Cities," Access No. 25, Fall 2004, pp. 2-8. Donald Shoup, "The Ideal Source of Local Public Revenue," Regional Science and Urban Economics, Vol. 34, No. 6, November 2004, pp. 753-784. Donald Shoup, "Truth in Transportation Planning," Journal of Transportation and Statistics, Vol. 6, No. 1, 2003, pp. 1-16. Douglas Kolozsvari and Donald Shoup, "Turning Small Change into Big Changes," Access, No. 23, Fall 2003, pp. 2-7. Jeffrey Brown, Daniel Hess, and Donald Shoup, "Fare-Free Public Transit at Universities: An Evaluation," Journal of Planning Education and Research, Vol 23, No. 1, Fall 2003, pp. 69-82. Donald Shoup, "Buying Time at the Curb," in The Half-Life of Policy Rationales: How New Technology Affects Old Policy Issues, Fred Foldvary and Daniel Klein (eds. ), New York: New York University Press, 2003, pp. 60-85. Donald Shoup, "Roughly Right vs. Precisely Wrong," Access, No. 20, Spring 2002, pp. 20-25. Jeffrey Brown, Daniel Hess, and Donald Shoup, "Unlimited Access," Access, No. 19, Fall 2001, pp. 40-41. Jeffrey Brown, Daniel Hess, and Donald Shoup, "Unlimited Access," Transportation, Vol. 28, No. 3, August 2001, pp. 233-267. Donald Shoup, "Instead of Free Parking," Access, No. 15, Fall 1999, pp.8-13. Donald Shoup, "In Lieu of Required Parking,"Journal of Planning Education and Research, Vol. 18, No. 4, Summer 1999, pp. 307-320. Donald Shoup, "The Trouble with Minimum Parking Requirements," Transportation Research Part A, Vol. 33A, Nos.7-8, September/November 1999, pp. 549-574. Donald Shoup, “Congress Okays Cash Out,” Access, No. 13, Fall 1998, pp. 2-8. Donald Shoup, "The High Cost of Free Parking," Journal of Planning Education and Research, Vol. 17, No. 1, Fall 1997, pp. 3-20. Donald Shoup, "Evaluating the Effects of Cashing Out Employer-Paid Parking: Eight Case Studies," Transport Policy, Vol. 4, No. 4, October 1997, pp. 201-216. Donald Shoup, “Is Underinvestment in Public Infrastructure an Anomaly?” in Gareth Jones and Peter Ward (eds. ), Methodology for Land and Housing Market Analysis, London: UCL Press, 1994, pp. 236-250. Donald Shoup, "New Funds for Old Neighborhoods: California's Deferred Special Assessments," California Policy Seminar Brief, 1990, 4 pp. Donald Shoup, "New Funds for Old Neighborhoods: California's Deferred Special Assessments," Berkeley: California Policy Seminar, 1990, 31 pp. Donald Shoup, "Intervention through Property Taxation and Public Ownership," in Urban Land Policy, New York: Oxford University Press, 1983, pp. 132-152. Donald Shoup, “Financing Public Investment by Deferred Special Assessment,” National Tax Journal, Vol. XXXIII, No. 4, December 1980, pp. 414-429. Donald Shoup, “The Effect of Property Taxes on the Capital Intensity of Urban Land Development,” in George Break (ed. ), Metropolitan Financing and Growth Management Policies, Madison: University of Wisconsin Press, 1978, pp. 105–132. Richard Pollock and Donald Shoup, "The Effect of Shifting the Property Tax Base from Improvement Value to Land Value: An Empirical Estimate," Land Economics, Vol. 53, No. 1, February 1977. Donald Shoup, “Theoretical Efficiency in Air Pollution Control,” Western Economic Journal, September 1971, pp. 310–313. Donald Shoup, “Effects of Suboptimization on Urban Government Decision Making,” Journal of Finance, May 1971, pp. 547–564. Donald Shoup, “The Optimal Timing of Urban Land Development,” Papers of the Regional Science Association, Vol. XXV, 1970, pp. 33-44. Free Parking Comes at a Price, National Public Radio, April 30, 2005. The Scourge of Free Parking, Los Angeles Times, April 17, 2005. The High Cost of Free Parking, San Francisco Chronicle, June 3, 2005. No Such Thing As Free Parking, Hartford Courant, June 5, 2005. Ruth Knack, Pay As You Park, Planning, May 2005, pp. 4-8. Bruce Schaller, Finding a Parking Space, Gotham Gazette, March 13, 2007. Pave paradise? No, ditch the parking lot. New Urban News, April/May 2005. Parking in Westwood Village: An Inconvenient Truth, UCLA Today, April 10, 2007. UCLA parking woes rooted in faulty pricing, UCLA Today, April 26, 2005. Put Los Angeles Back on Its Feet, Los Angeles Times, December 1, 2001. Let a Tree Grow in LA, Los Angeles Times, May 10, 1996. Comments on UCLA's fare-free transit program.